The Natalie dress is a comfortable & casual classic style with an amazing flattering fit! Features include a rounded neckline, half-sleeves, and a flowing gathered a-line skirt. Easy pullover style. This print also includes pockets! The fabric is incredibly soft & breathable. The simple silhouette is easy to accessorize, whether you need to dress it up or down. 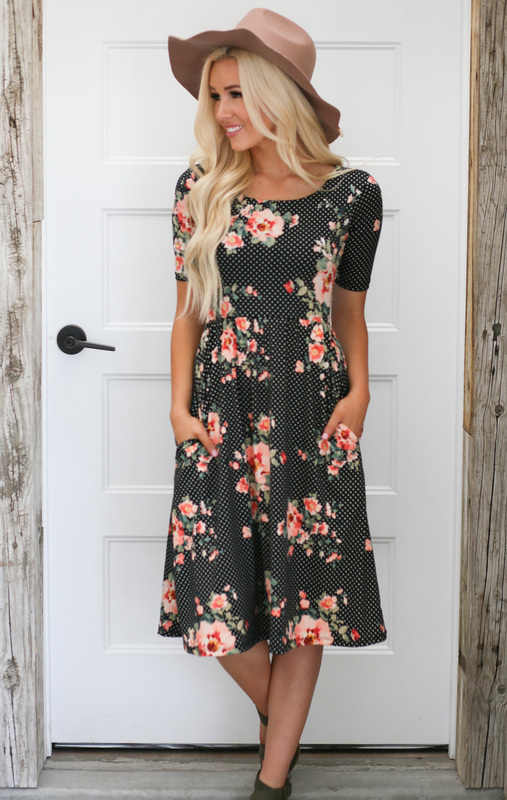 It works beautifully for church, date night, or just a fun, casual dress! Also available in Burgundy w/Floral Print, Red Bean Floral Print, and 2 Crepe Solid colors: Lilac and Pink. Length: (from shoulder to bottom of dress) XS-S 39", M-L 40", XL-2XL 41"